FIRST: Save 4 before 4. In other words, save $4 before 4pm on Sunday. $17 advance tickets are no longer available. Tickets are now $25 plus services charges, but to combat that we’re offering you an early walk-up deal of only $21 for almost 30 bands (29). SAY “FOUR BEFORE FOUR” and get there before 4PM, duh. First band, Netherfriends, begins at 1:30PM followed by Growlers, Hospitality, Gauntlet Hair, Titus Andronicus & White Mystery all by 4pm. If you’d like to start your day off heavy, then Big Fiction starts off at La Grange at 4pm. SECOND: GIVEAWAYS: We’ll be taking all the pre-sale names and entering them in drawings for all upcoming shows, t-shirts, bro-fest posters. We’ll have a table set-up and we’ll be having hourly giveaways. So check the merch booth to see if you’re name was picked and then you choose a prize. Third Stage: La Grange – 2704 Elm St.
Why didn’t I do $5 before 5pm and make it an even $20? B/c presales end up being $21.25 with service charges & fees if you purchased a $17 pre-sale ticket, so I thought it wasn’t fair if I made walk-up tickets cheaper. 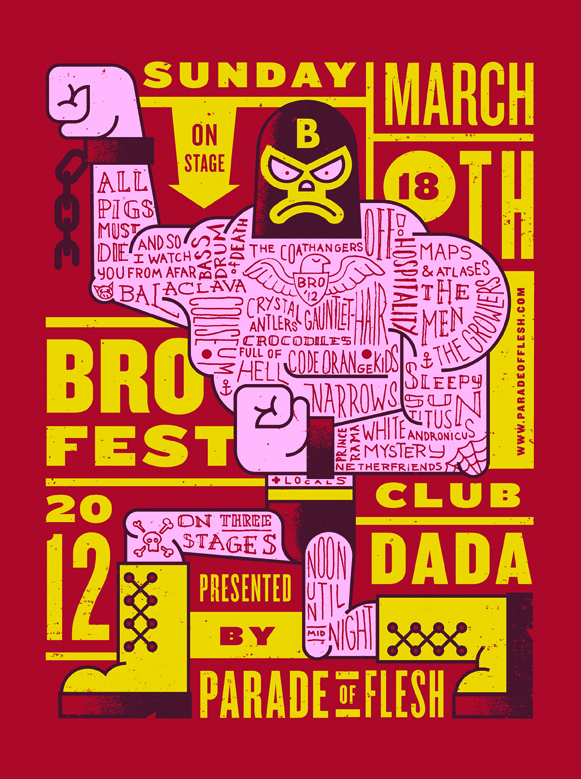 This entry was posted on March 18, 2012 at 12:01 am, filed under News and tagged brofest 2012, club dada, la grange.